A little over two years ago I developed a mass on the right side of my neck. I didn't go to the doctor right away for two main reasons; one, I figured it would go away and two, I was hoping it would go away. In April of 2017 I started having trouble breathing and I developed a smoker's cough without having had a single cigarette in my life. It was time to finally visit the doctor. After numerous CT scans, biopsies and countless doctor's visits, I finally had a full thyroidectomy in September. A couple weeks after the surgery, I was informed that the pathology report showed cancer cells. So back to doctor's visits I went. I was then told after a follow up CT scan that the cancer has metastasized even after the surgery. So here I am left with a horrible disease and a very active one year old cat who has successfully became very obedient on the leash. One thing about life is its got a way of showing you what truly matters. After training my cat to walk on a leash, I started cutting back on my hours at work. I went from working 35-40 hours a week to working 20-26 hours a week. I asked to be off three days in a row right in the middle of the week so that I can go hiking with my Cat when it's less crowded. 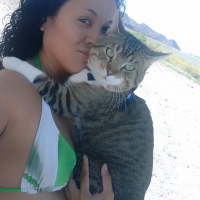 This decision was so ideal that my cat has successfully hiked red rock canyon, death valley, valley of fire and has discovered several canyons with Petroglyphs all within the course of a few months. These weekly excursion has taught me solitude and peace. My favorite copilot, roadtripper, confidant and buddy taught me to slow down and smell the desert. How funny it is that I didn't learn to live until I was slapped with the idea of death. And how exciting it is to fight this terrible disease so that I can embark on many more adventures with my Cat. Suddenly my bucket list wasn't a bucket list anymore, they were simply Tuesday hikes with Hades.